The improvement project is aimed at creating a continuous recreation area which will link scattered districts of Dubna and the Volga River with the surrounding natural landscape. The reconstructed embankment will be integrated into the unique archeological and aesthetic image of the town and become part of the social and recreational infrastructure. You can get acquainted with the preliminary design decisions presented to residents on January 29, 2019 via the presentation at this link. questionnaire concerning the design of territory No. 2 (Komsomolskaya Embankment). All of your thoughts are important, in that they allow the development of an embankment where any visitor will feel at home. Identifying key queries of various target groups and ensuring the functionality of the design area. Creating a modern architectural and aesthetic image of the town territory. 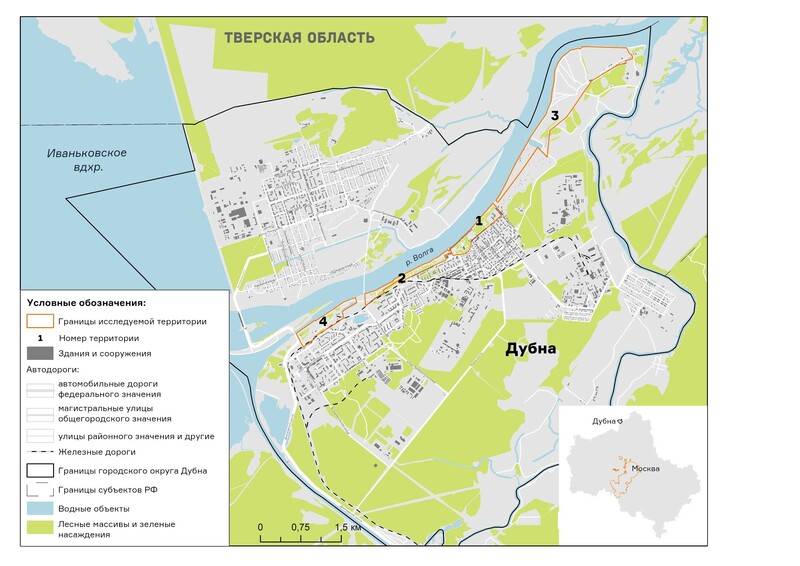 Ensuring the permeability and coherence of separate design areas along the Volga River embankment. Creating a comfortable, appealing and safe urban environment on the development site. Developing an additional social and recreation infrastructure within walking distance. Ensuring attractive conditions for both town dwellers and visitors.